Devil’s Advocate columnist Leaping Larry, of The Age, once again hits the nail on the head in his most recent thoughts about statistics. We are truly fortunate to be living in a football age of so many “performance indicators”, and a general avalanche of statistics. Thanks to all these figures for loose-ball grits, apple turnovers and uncongested marks, we already know who the best players were, even if half their disposals landed safely in the arms of the opposition or sconed a passing pie-boy. Actually watching the play can only lead to hideous and avoidable confusion, such as when a team leads in just about every single performance indicator, except for the stubborn and recalcitrant scoreboard, where it trails. If we all just stick to the stats, we’ll all be on the same page. You can read more quotes about scoreboards, and especially scoreboard pressure, in Scoreboard quotes. A stubborn scoreboard if ever there was. This Altona North scoreboard, at Crofts Reserve in Melbourne’s west, isn’t going anywhere. Post-script: this scoreboard was demolished sometimes between May 2010, when I took this photo and August 2012, when I returned tt do the scores for a Williamstown reserves game. 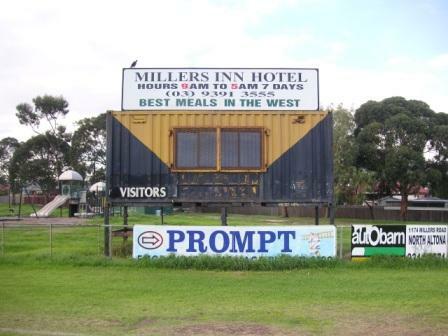 Scoreboard and Crofts Res may have been in Altona North, but the ground was home to Central Altona… wearing black with a yellow yolk as the scoreboard shows. Altona North also once hosted ANBY (Altona North Brooklyn Youth) FC. I think both have gone now from the WRFL. Thanks for the info about the clubs that played at Crofts Reserve. I’ve got some more pics from a recent visit and will do a seperate post about the ground soon.